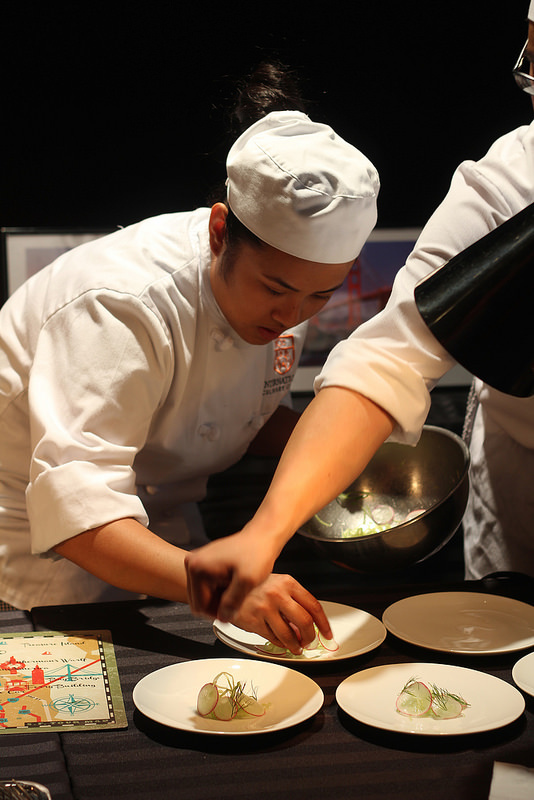 The 2nd annual Ultimate Culinary Clash, a cooking competition and scholarship fundraiser hosted by the InterContinental Hotel & Resorts brand held on May 6, brought together student chef winners of four regional Culinary Clash competitions. The finalists presented their winning entrées to an esteemed group of judges consisting of renowned chefs, such as Todd English, hotel executives, media and more, for a chance at a $5,000 scholarship. With a commitment to culinary excellence, the InterContinental Hotel & Resorts brand began the competition and scholarship as a way to inspire the next generation of chefs by supporting their talent and training. 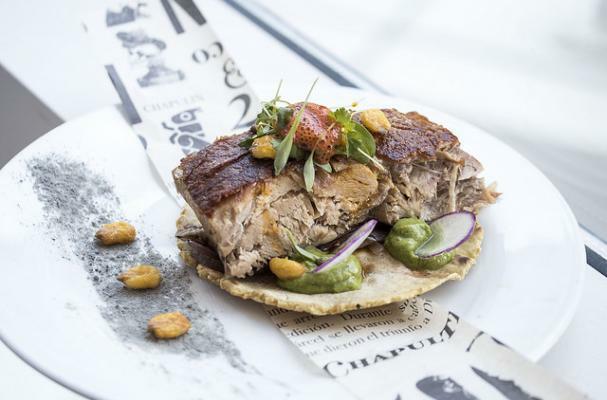 The contestants in this year’s competition represented the InterContinental Cleveland, InterContinental San Francisco, InterContinental New York Times Square, and Presidente InterContinental Mexico City. 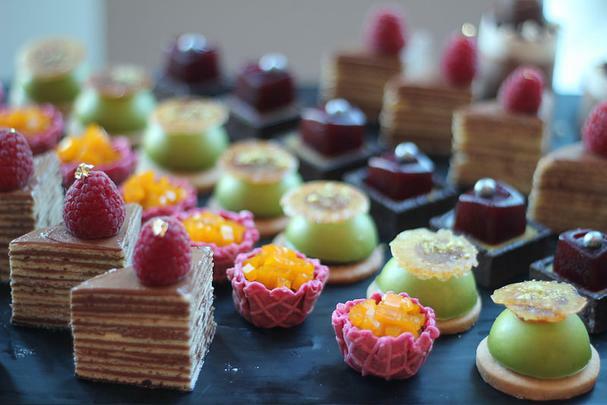 The dishes were scored on creativity, taste and presentation. 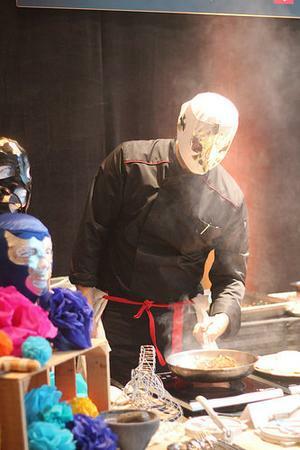 Each dish created was incredible, which made it difficult to select a winner. 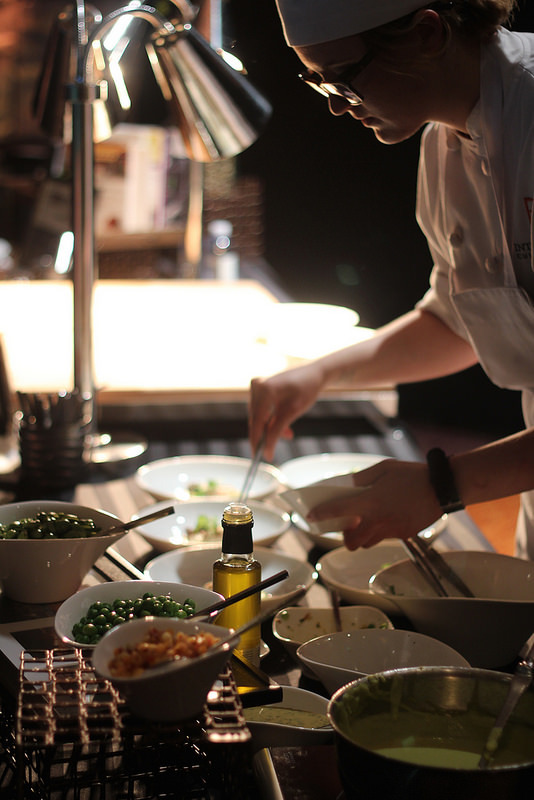 These talented young chefs are going places in the culinary world, so remember their names. 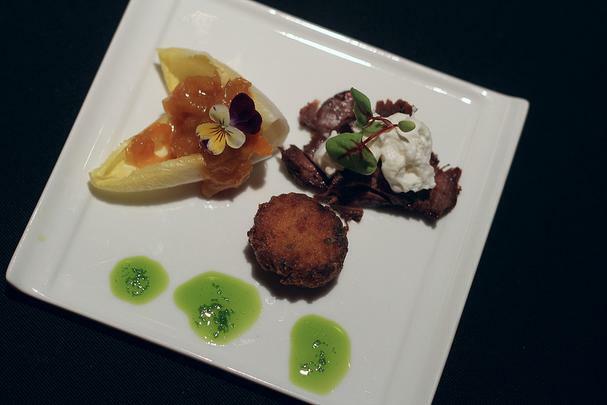 Magdalis Galzara, representing InterContinental Cleveland, served her Grilled Skirt Steak with Horseradish Aioli Foam, Belgian Endive and Orange-Cumin Marmalade, and a Potato-Cauliflower Fritter. 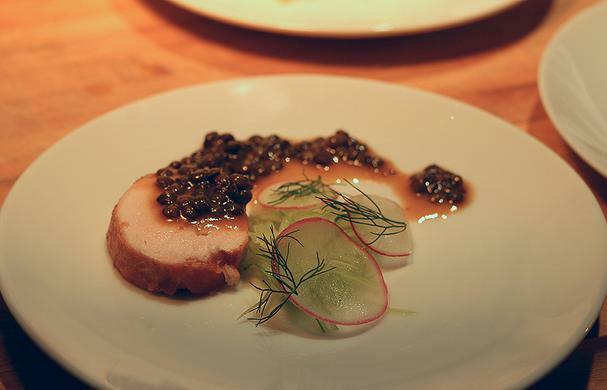 Christopher Wan, representing InterContinental San Francisco, served a decadent and juicy sous vide Roasted Breast of Chicken with Leg Sausage, Red Lentils with Red Miso, Grain Mustards, and Fennel. 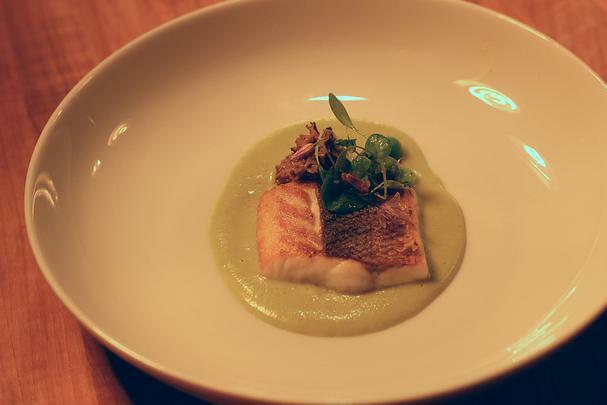 Chloe Sackett, representing InterContinental New York Times Square, served a fresh and tender Spring Tilefish with Fava Bean Puree, and Ramp Butter. The $5,000 culinary scholarship deservedly went to Ana Paula Oviedo Gómez, representing Presidente InterContinental Mexico City. 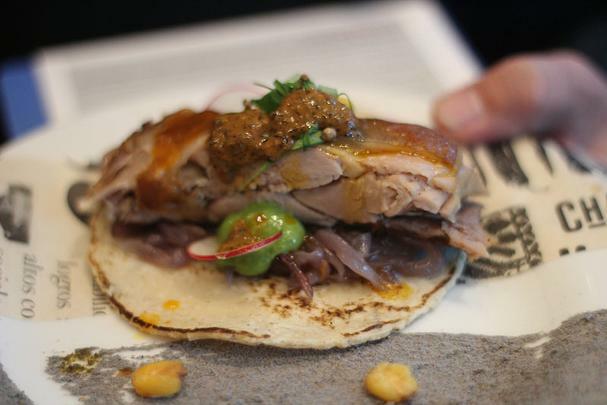 Her winning dish was Taco de Lechón, an unctuous 12-hour roasted suckling pig taco. Get her amazing recipe below. Chop the onion and mince the habanero chili. In a small frying pan, over medium-high heat, sauté the chopped onion with a little bit of oil. When the onions begin to soften, turn the heat to medium and add minced habanero chili, sugar, thyme, bay leaf and squeeze of lime. Cook until caramelized. Mix all ingredients together in a blender, then season to taste. Place the oil in a cold pan and heat it up very gently at a very low temperature. Once heated, add the habanero chili in slices and leave for 1 hour. After cooling down, add the orange zest and let sit overnight. In a large frying pan, char the tomatoes until the skin goes black and the inside is very soft. Next, do the same with the onions, the garlic and the chilies. This technique is called “tatemar.” Once you tatemar the chilies, put them in water in order for them to get soft. Meanwhile, blend the tomatoes, onions and garlic with a little water and set aside. Then, blend the chilies and put the resulting paste into a hot pan with oil. Let cook for a few minutes, then add the tomato paste and stir. If the paste is too thick, add a little bit of the water the chilies soaked in. Season to taste. Prepare the suckling pig by removing the head and feet. Rub with sea salt and leave refrigerated for 2 hours. Then, wash the pig gently to remove salt and confit in a deep baking dish with lard in the oven for 12 hours at 200 degrees F. Once cooking is finished, let sit for 30 minutes, then gently remove the bones, leaving the skin in-tact. Place another, heavy pan on top of the pig to press it into a terrine. Let sit for 10 hours. Portion the pig and sear portions in a hot pan with the skin side down. 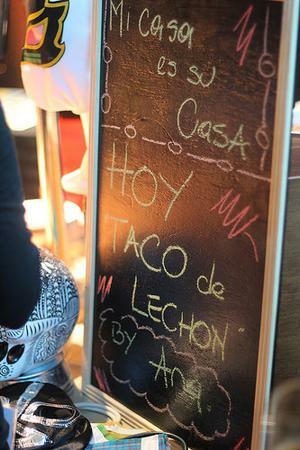 To serve: Lay a tortilla flat and cover with caramelized onion mixture. 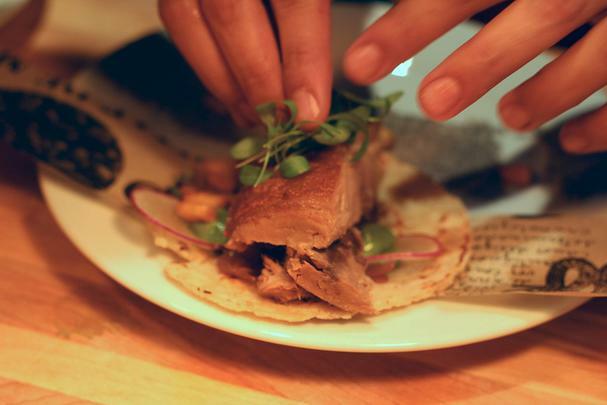 Add portion of suckling pig, and top with Adobo, Creamy “Salsa Verde,” and Habanero Oil to taste.